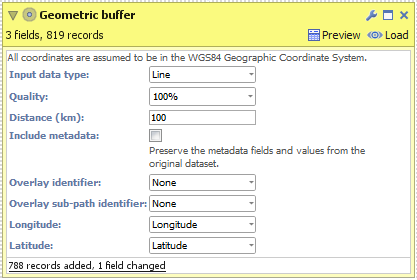 Omniscope's DataManager supports buffering of geographic shapes by applying a fixed distance to extend/contract the original geometry. For example, this could be used to generate a sales area around a shop using a Euclidean (straight line) distance in all directions. 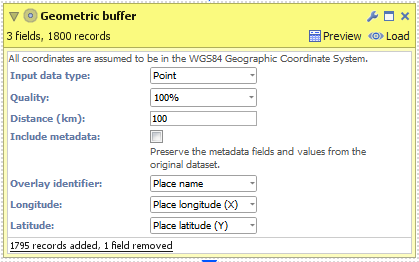 Point - A dataset containing pairs of latitude/longitude coordinates, e.g. a shop location. Line - A dataset containing connected, and unfilled/unclosed, chains of points, e.g. a hurricane path or road. Area - A dataset containing connected, and filled/closed, chains of points, e.g. a post code area or country border. Drag "United Kingdom cities.csv" onto the DataManager workspace. This contains 5 major cities in the United Kingdom with latitude/longitude coordinates. Connect a "Geometric buffer" operation to the workflow. Enter a distance (km) to buffer around each input point. By reducing the "Quality" you will increase the speed of this block but the output dataset will contain less records and the buffered outline will not be as smooth. 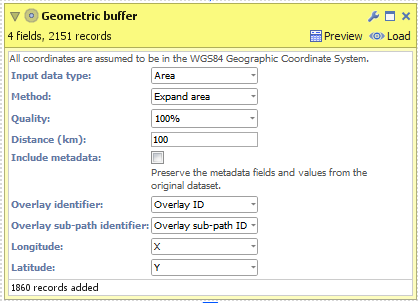 Check 'Include metadata' if you would like the output dataset to contain all other fields found in the input, i.e. "Country name". Execute the block, load the data into Omniscope and then drag a Map View into Omniscope to see the buffered points. Drag "Hurricane Katrina.csv" onto the DataManager workspace. This contains coordinates for the path of Hurricane Katrina in 2005. Enter a distance (km) to buffer around the line (hurricane path). By reducing the "Quality" you will increase the speed of this block but the output dataset will contain less records and the buffered outline will not be as smooth. Execute the block, load the data into Omniscope and then drag a Map View into Omniscope to see the buffered line. 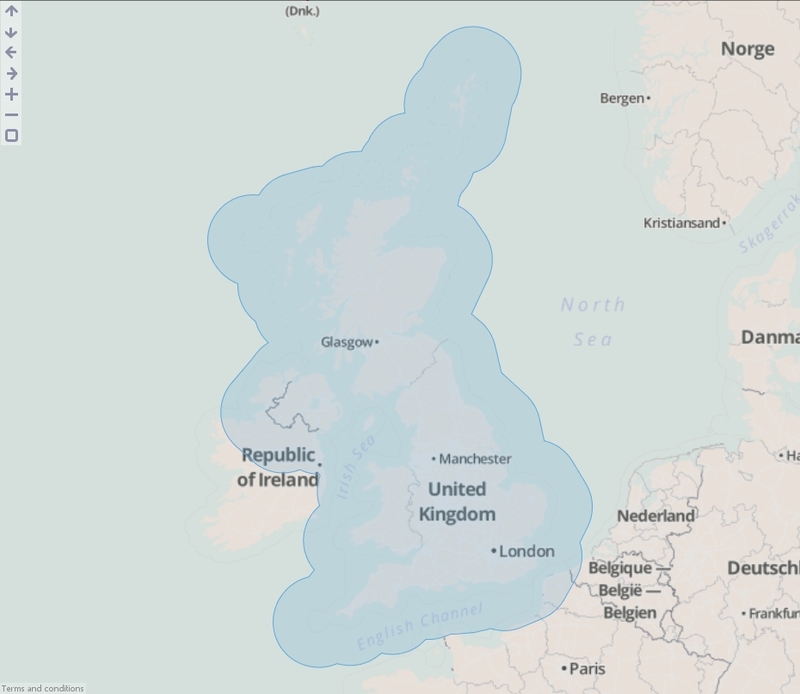 Drag "United Kingdom.kml" onto the DataManager workspace. This contains coordinates defining a simplified boundary of the United Kingdom.. Expand area - The original area plus an outside perimeter. Contract area - The original area less an inside perimeter. Outside perimeter - The area within a certain distance outside of the perimeter. Inside perimeter - The area within a certain distance inside of the perimeter. Outside + inside perimeter - The area within a certain distance either side of the perimeter. Enter a distance (km) to buffer around the United Kingdom. By reducing the "Quality" you will increase the speed of this block but the output dataset will contain less records and the buffered outline will not be as smooth. Overlay identifier - Field containing unique identifiers for each point, line or area in the input dataset, e.g. a field containing country names or postal area codes. Overlay sub-path identifier - This is used internally within Omniscope to identify nested geometries within each shape. For example a shape for the United Kingdom could not be drawn with one continuous line. We use this field to breakdown the records into numerous islands which make up the country.